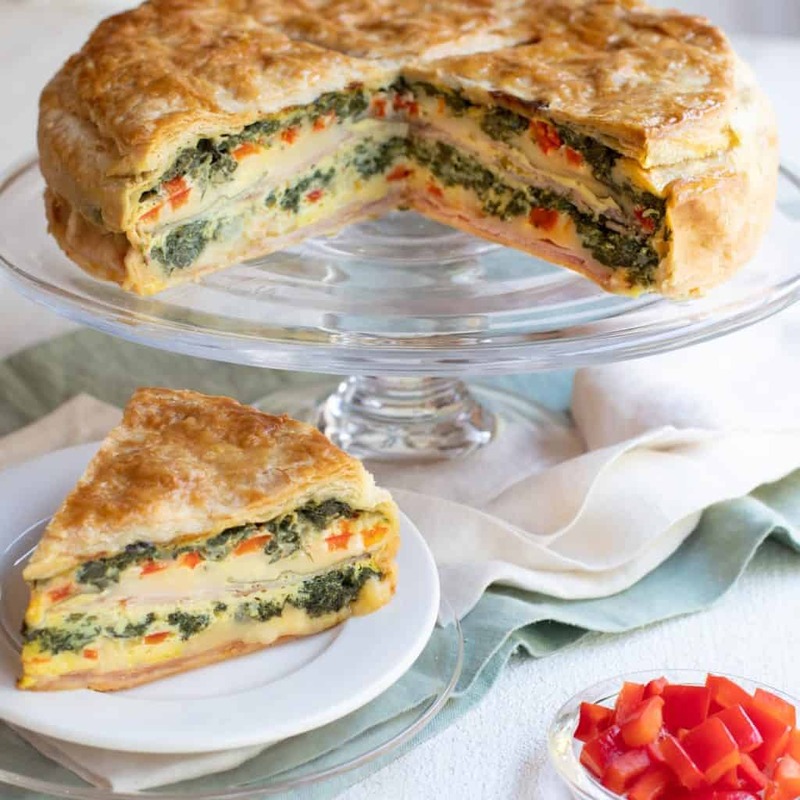 Ham, Cheese and Spinach Torte is a colorful dish layered with lots of flavor, and is so versatile it can be served for lunch, brunch or dinner! The other day I was perusing recipes from my mom’s collection and discovered that there were two cards with the exact same dish – one in mom’s handwriting, and she had noted it was from her friend Karen Wohl, and a second card in someone else’s handwriting I don’t recognize. Evidently this recipe was super popular among mom’s friends, since two different people gave it to her! That piqued my interest, so I had to try it – and I’m so glad I did. It’s easy to prepare, colorful on the plate, and scrumptious. Not surprising, as that’s how I would describe most all of the recipes from my mom! 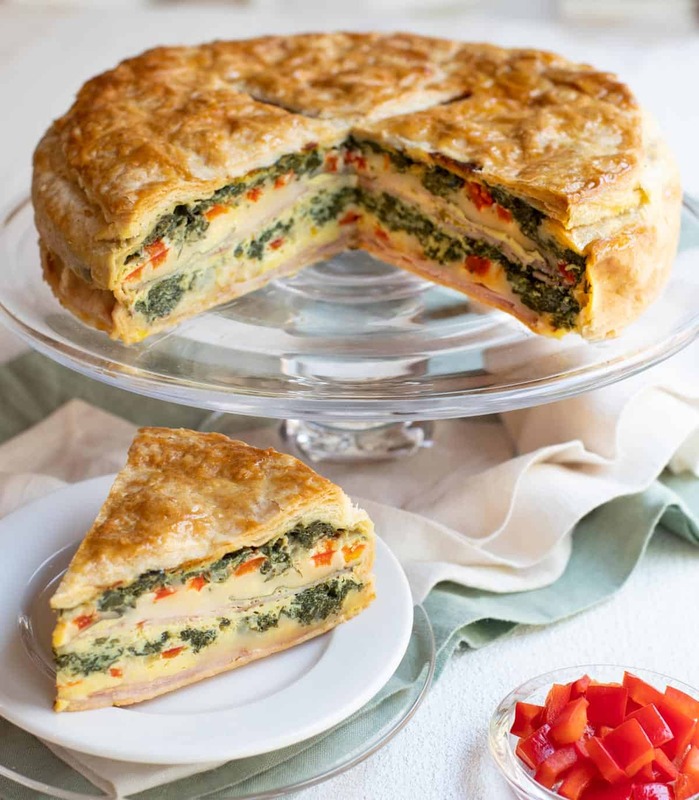 This Torte is basically a puff pastry shell that’s filled with layers of ham, provolone cheese, basil, spinach mixed with onion, garlic and oregano, red bell peppers, and eggs. The friends I asked to test this recipe gave it rave reviews, as did my husband Robert! While this dish is good any time of year, I am so excited to have it in my repertoire for the summer, as I can envision taking it to potlucks, picnics and other celebrations. And, you can make it ahead – so, what more could you ask for? In a large stockpot, melt butter over medium heat. Add onions and garlic and cook until soft. Reduce heat to medium low, and add spinach by handfuls, stirring constantly, until the spinach wilts. Continue cooking, stirring often, until most of the water from the spinach is cooked off. Remove from heat and strain; put back in pan. Stir in oregano and season to taste with Tabasco, salt and pepper. Set aside to cool. Roll out 1 sheet of thawed puff pastry to around a 14-inch square – it should be large enough to cover the bottom and up the sides (close to the top) of a 10-inch springform pan. Transfer to pan, and gently push on bottom and sides of pastry to remove any air from underneath. Set aside. In the pastry shell, evenly layer (in the following order) half of: the ham, basil leaves, Provolone cheese, red peppers, spinach mixture, and eggs. Repeat layers. Fold the excess pastry from the sides of the pan over the filling. Brush top of folded over pastry with egg white. Roll out second sheet of puff pastry to slightly larger than a 10-inch square. Lay over the top of the pan; cut off any excess around the sides so that the second sheet fits snugly in the pan, on top of the torte. Gently press down around the edge to adhere. Put a few cuts in the top pastry sheet, to allow steam to escape. Brush top with egg white. Place pan on a rimmed cookie sheet and bake on middle rack in preheated oven for 35 minutes. Reduce oven temperature to 350 degrees and continue baking for an additional 45 to 50 minutes. Pastry should be slightly puffed and golden brown. Cool at least 10 minutes before cutting into wedges and serving. I like this torte best when warm but it is also good served at room temperature. I don’t recommend serving it cold. Vegetarian variation: substitute sliced, cooked mushrooms for the ham. Make ahead: Can be prepared and baked up to 24 hours in advance, covered and refrigerated. Bring to room temperature and reheat at 350 degrees – takes around 45 minutes. Tip on using puff pastry: It is important when working with puff pastry to keep it cold. If it gets warm, it will be difficult to roll and cut, and won’t puff as much when baked.